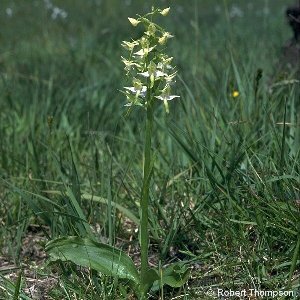 Greater Butterfly Orchid (Platanthera chlorantha) occurs in pastures and other grassland situations and grows to a height of between 8 and 24 inches. The plant has two large oval leaves and a number of smaller pointed leaves higher up the stem. There are 10 - 24 large white flowers carried on long ovaries. The appearance of the flower is very striking; there are two long sepals at either side which spread sideways and downwards: between them is a long narrow lip pointing straight down. The rest of the flower segments form a loose hood over the top of the flower. The base of the flower has a curled spur. Looking into the "throat" of the flower it is possible to see the two pollinia (egg-shaped masses or clumps of pollen) sitting either side of the wide entrance to the spur. 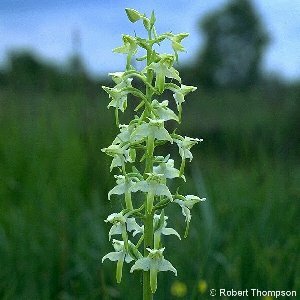 (In Lesser Butterfly Orchids they sit close together and the throat is almost closed). All names: Platanthera chlorantha (Custer) Reichb. ; Habenaria montana auct. ; Habenaria virescens Druce, non Spreng. ; Habenaria chloroleuca Ridl. ; Habenaria chlorantha (Custer) Bab., non Spreng.